My broccoli, cauliflower, and fennel roast. Tossed in olive oil, rosemary, thyme, sea salt and pepper. Yummmm....and makes the kitchen smell wonderful, too! Why do we want to have a variety of these cold dishes as part of our regular diet? The reason is quite simply because in today’s world, it is a relatively easy way for us to get a variety of vegetables, and sometimes fruits, into our lives. And that’s important because vegetables provide us with vitamins and minerals (to include antioxidants), fiber, and water…..all of which are super important to human health. In our fast paced, fast food world, we have lost sight of the real meaning of “food”. Food first nourishes. Yes, it should be tasty and satisfying and therefore “nurture” us as well, but let us not lose sight that its first purpose is to nourish….to literally feed our cells to not only keep us alive, but to keep us “healthfully alive”. Many of us look to food purely for enjoyment. While most cultures do build food into events and gatherings, making it a very social activity, those same cultures also have, as their base, real food combinations that actually nourish the body. It is when we get away from the traditional eating and cooking styles of our ancestors that we get away from food that nourishes. Because getting good nutrition for ourselves and our families is imperative for our health and that of future generations, and because our food supply has become so adulterated (a whole other conversation), keeping salads in our eating plan is a way to eat real, whole foods that nourish us, combined in such a way that they delight the senses (taste, touch, smell) as well. And it is this appeal to a variety of senses that satisfies us. And now, the good news is that there are many places where one can get a wonderful, fresh salad even if shopping for and preparing it from scratch is not going to happen regularly. Yes, you’re more in control when you make it yourself, but options for creating a healthy salad are growing and will continue to do so if we take advantage of them. The combinations of healthy veggies and fruits combined with such a variety of possibilities for the dressings makes for the likelihood that most palates can be satisfied by this healthful menu option. The trick is to experiment with a variety of greens, veggies, raw and cooked, toppings (all kinds of different proteins and toppings can be added for satiety and variety) to find the combinations that work for you. Consider trying different kinds of salads an experiment in your health. One that your body will thank you for! Come have a good time at my salad workshop. Click here to purchase tickets! If you understand the formula for weight loss; calories consumed (“calories in”) must be less than the calories expended (“calories out”) then you realize that calories (a measurement of energy) are the currency of weight control. It is amazing that so many “diet programs” ignore this basic fact. They may even go so far as to say that ‘calories don’t matter’. Truth is….they do! Now, don’t misunderstand….the kinds of calories and the quality of the calories matters just as much. Your body is not going to treat 200 calories of twinkies the same as 200 calories of broccoli! And how healthy you are and how you feel depends on making healthy calorie choices, for sure. The thinking, “I’ve blown it, so I might as well….” is an emotional assessment not based in reality. But because that thinking is very powerful, we are unable to see the reality is that we had more calories (and maybe more fat and sugar) than we had anticipated. Deciding to make the next eating choice a healthier, lower calorie one is the key to keeping an overindulgence from becoming a weight loss inhibitor. Doing basic accounting (income/expense) with our calories (eating/activity) is the way to successfully manage our weight. Simple math. We can all do it. 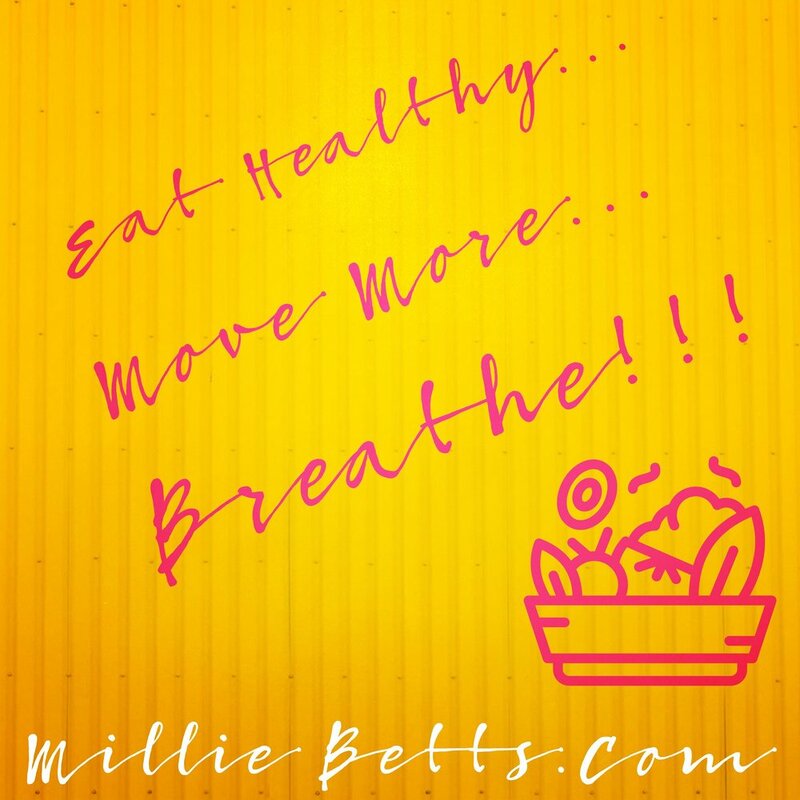 Millie Betts is a Health Coach, Weight Management Specialist, and Personal Trainer who specializes in helping her clients with healthy weight management. With over 35 years experience teaching and training healthy eating and exercise, she not only trains her clients in efficient and effective exercise, but her coaching expertise helps her clients learn what they need to do when she’s not with them so they can get what they want in terms of a healthy lifestyle/a better life! She can be reached at 703.421.4395 or millie@milliebetts.com. Or visit her website at www.MillieBetts.com. Eat healthy. How can you expect to look good, feel good, have great energy, and just be healthy if you are putting lousy stuff into your body? You can't. But we do. It's time to stop, think, and get back to basics. We have to quit trying to "cheat the system". The system, in this case, is your body. And while it is an amazing machine (well, not a machine at all, but for the sake of this conversation) but it has its limitations. Just like brand new car. You can drive it into the ground, not do regular maintenance, give it cheap parts and fluids, and it will run. For a while. And then it will break down. So will your body. It will do amazing things for you, but if you keep putting junk in....eventually you pay the price. Either you become overweight and/or obese, or you get sick, or you just flat out feel lousy all the time. Change your eating....change your body. Eat healthy....it's what your body thrives on. Move More. The human body was designed to get up in the morning and do hard physical labor all day. And it wasn't until just a few generations ago, that's what most people did. And it worked. But now it seems we look for every way possible to "save energy". And so we sit. The human body wasn't designed to sit. And it really wasn't designed to sit for long periods of time. Sitting has now been linked to higher risk of mortality. Get up! Move more. And don't get hung up on "purposeful exercise". Sure it's great to have good workouts that include strength, cardio, flexibility, and balance work. The body loves and needs that. But mostly it just needs to move more. Get up from your desk, or the couch or out of the car and walk. The body was made to be pretty good at that! Breathe! Stop and smell the roses. Take a break. Stretch and breathe. Sit by the ocean or the lake. Write a letter (the old fashioned kind that you have to mail). Make a long overdue call. Throw a ball for the dog. Dance. Sing a song. Be silly. Do a little yoga breathing. Say more prayers. Meditate. Read a book for sheer pleasure. Play games with the kids. Or with friends. Build a fire and just watch it. Take a walk just to smell the fresh air, and the flowers, and to hear the birds. It's important to unplug and just be. This is the stuff that creates balance in our lives. It is essential to rest. Yes, sleep is an essential component of rest. But so is all the other stuff. Take time out. It will restore you.